On November 2, Garberville Lions, Ted Madsen, Richard Thompson, and Dave Widner attended the Multiple District 4C-2 Cabinet Meetings in Windsor, Ca. The focus to the meeting was training on the Pediavision Spot, vision scan device. The district has purchased seven of these units to share among the Lions Clubs six regions. 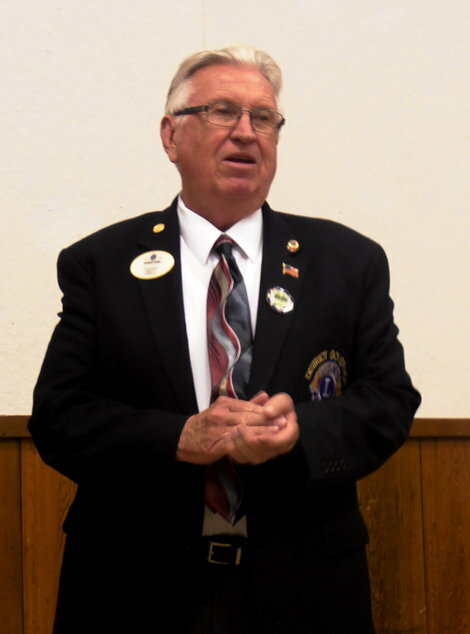 Garberville Lions first learned of the Pediavision Spot technology during District Governor Don Webb and 1st Vice District Governor Buck Larson’s visit in September. The district purchased the Pediavision Spot technology with contributions from clubs in the district and a matching grant from Lions Clubs International. The importance of acquiring this technology was amplified when District Governor Don Web revealed that eyes are fully developed around eight-years-of-age. Early detections of problems makes it possible to avoid more serious problems later in life. Pediavision Spot is able to detect problems in people as young as 6 months of age and as old as 100 years. Some medications and cataracts may interrupt the Spot’s ability to scan eyes. 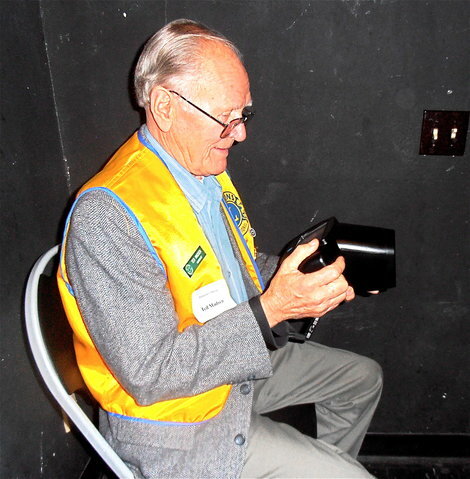 Garberville Lions will be doing free vision scans three to four times a year once the technology arrives. We will be publishing the dates of Pediavision Scanning in the future. Look for those dates and take advantage of these opportunities. Garberville Lions took 275 pairs of glasses and nine hearing aids to the Cabinet Meeting thanks to the community donations collected from the following locations: North Valley Bank, Rays Pharmacy, and Home Cooking. These glasses and hearing aids are cleaned, repaired, and distributed to people in less developed nations around the world. If you are interested in being a part of a group of people concerned about helping the others, visit one of our meetings on the first and third Monday at 7:00pm at the Community Presbyterian Church to see if the Garberville Lions is a fit for you. Past District Governor Marty Van Zandt said, “The Student Lion of the Year award was instituted as part of international efforts to become a more family oriented organization. The award is intended to recognize, encourage and reward responsible citizenship by youth in our communities. Those young people who learn to serve the community are our positive legacy for the future.” The Student Lion of the Year for Multiple District 4C-2 has been given to eight Student Lions including Courtney since 1998. The Garberville Lions knew nothing about this award until the trophy and plaque was received by the Garberville Lions from the 4C-2 District. Garberville Lions were honored to present the ‘Student Lion of the Year to Courtney. She will keep the trophy for one year. The plaque that accompanied the trophy remains with her. Following the presentation to Courtney, Richard Thompson installed David Widner as the Membership Director for 2013-2014 and appointed him as the installing officer who conducted the installation of the 2013-2014 Garberville Lions officers. Dan Arbuthnot was installed as Vice President. Richard Thompson was installed as Treasurer. Rhonda Harris was installed as Secretary, and Starla Widner was installed as President. Theodore Madsen was also elected to serve as a member of the board of directors of the Garberville Lions Club. 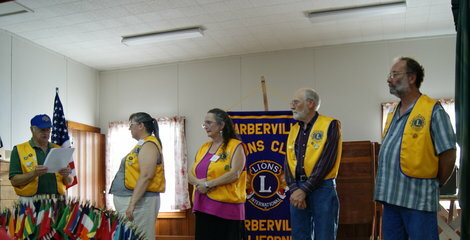 Garberville Lions also welcomed our new member Tom Puskarich who transfers from the Lions Club in Bernie, California. 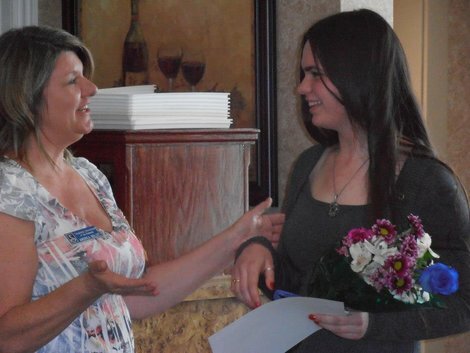 On March 14, 2013, Student Lion CourtneyAnne Weaver was awarded the Honoring Young Women for Volunteer Action award by the Soroptomist International of the Redwood. 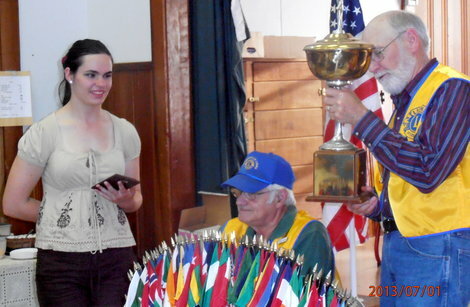 Courtney was cited for her volunteer efforts with the Garberville Lions. Courtney has been active in assisting in the distrubution of food through the Community Food Pantry. She has also made gifts for Christmas baskets delivered to the Cedar Street Senior Housing tenants. She has knitted teddy bears for children requiring medical care at Redwood Memorial Hospital. The Garberville Lions are proud of the contributions that our Student Lions make and their desire to serve the community.